Issued in a plain white paper sleeve, some copies with additional clear plastic sleeve. Available in different coloured labels of white, yellow, orange, red and brown - this is the version with the white labels. No track listing on release, the only printed details are on two stickers glued to paper sleeve and one label side. 33 1/3 & +6 on the pitch for the Box Energy. Mathematical breakbeat big boy b*stard acid! Perhaps it is debatable what speed the Box Energy remix is intended to be played at, but I always played it at 33 1/3 and thought it sounded perfectly natural and much better than at 45. Give it a try. Don't be scared, drop "Box Energy" sometime on 33rpm pitched up a little instead of 45rpm and be amazed. The tune magically turns into one of the sickest Acid Breaks tunes that I've ever heard. Seriously. Track Flow Coma with group 808 State is one of Richards all-time favourite track according to available booklet for the compilation record Artificial Inteligence from Warp Records (Catalog# Warp Cd 06). I hope he will release remixes of missing 4 tracks later. I'd be hard pressed to find a slab of vinyl that contains a better set of remixes than this here beauty. Acid is the the common theme, but the tracks couldn't be more different. The Flow Coma remix thankfully doesn't disperse too much with THAT acid line, in fact RDJ appears to compose the track around this using it as an anchor for his ship of crisp breakbeats and wigged out vocal gurgles. The (purposeful) slapdash phat scratch break in the tune is vintage Aphex and is his stamp on this ode to 808 State. On the flip he reworks and transforms 303 maestro Pierre's Box Energy into a manic Acid drenched Jungle trip that leaves you gasping for breath as the 303s/breaks/drums burst forth like a biblical flood. 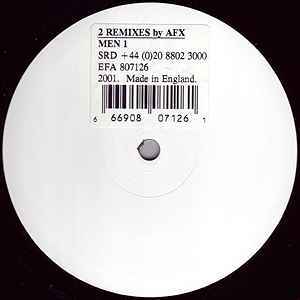 Aphex does his weird break thang with a vocal (presumably not RDJ) recollection of 'Tom' dropping an E and wanting to "do this again, do this again", before a splash of reverb and eerie sounds launch you into the toxic jungle again. Phew, what an effort from RDJ. the CAT catalog number is the catalog number format of the rephlex label.